My car began spinning on the black ice that I could not see on the highway. Then, my car slid off the highway, ending up in the San Juan River. It was the most frightening thing that has ever happened to me. Sadly, the entire car became submerged in the murky water. As I was becoming surrounded by complete darkness, a bright light summoned me. I felt myself being pulled in the direction of the light, feeling absolutely no fear. 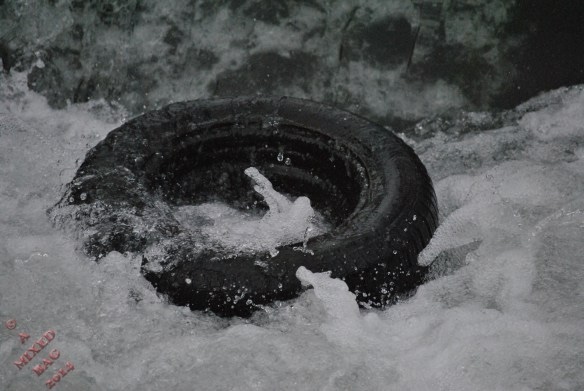 My life began taking on a new meaning as I watched the tire bobbing on top of the rushing river. 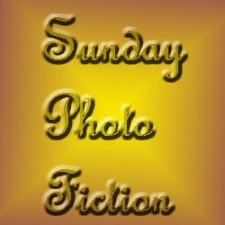 Al Forbes is the kind host of Sunday Photo Fiction and has provided us this photo prompt for our stories. This is my 100 word submission for the challenge, Sunday Photo Fiction, where we are given a photo prompt and approximately 100-200 words with which we are to use to create our stories. It is fun and addicting and everyone is invited to participate. For more information, click HERE. To read all the wonderful stories submitted by great creative writers, click HERE. Wow this is a great story!! Very different and I like that although sad! Thank you Lynn! Yes, it is sad. It’s about death. But there is also peace at the end too. ok I felt that it was and yes I did feel the peace! I hate to be wrong haha and take the wrong meaning but that is what I got from it and it was lovely! Thank you so much. I’m glad you enjoyed reading it and you could feel the peace at the end. yes I did and i liked it!! Oh, and you can’t be wrong because whatever you get from a story is right. They are open to their own interpretation. Well done Priceless! Heartbreaking, and peaceful at the same time. Its comforting to think there’s something else. I took this to mean that the ‘light’ was guiding the person to the tyre, so they would be saved! Maybe that’s the alternate ending… Good story. That’s a wonderful alternate ending! A good story fires the imagination! Thanks for yours. Thank you Mandi. 🙂 It is sad at the end but also peaceful. I think that is a hopeful thing. Though people suffer in life and death at the end their is peace. Great job! It is sad but peaceful. Great story! Beautifully done, Joy! Sad that life as he/she knew it was no longer, but comforting to feel no fear for the new life summoned. Interesting story. I also thought about the rescue team shining the light and then then the tire helped to rescue ‘you’. That would have been a great ending! LOL! They have great endings! Thank you Cat! 🙂 Good to hear from you. Black ice isn’t fun. I encountered it going slowly up an on ramp. Lost control of my car and smashed the front end into the concrete road divider. Thankfully, while the car was toast – I was not. Thanks for visiting a BeeBee mystery snippet. Oh, that is terrible! I’m so glad you were alright even though your car wasn’t.